The New York Times (NYT) has long been a lighting rod for criticism, and things are no different regarding its India coverage and analysis. Economist Vivek Dehejia for one has criticised what he calls the “rabid anti-India editorializing of today’s New York Times” and attributed it to the “unremitting hostility of the Anglo-American liberal media establishment” towards the BJP. So does the NYT have an “India problem”? 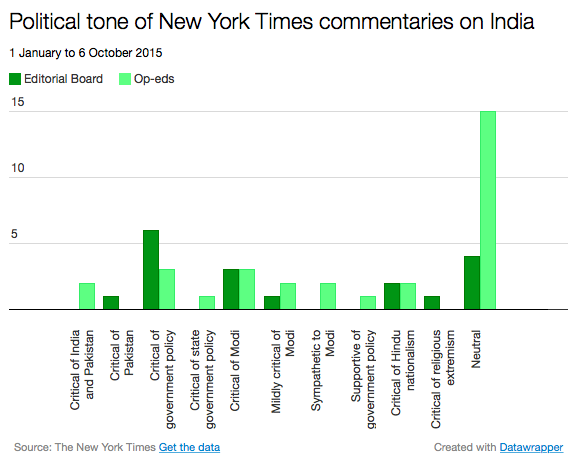 Between 1 January and 6 October 2015, the NYT carried 49 commentaries about India, of which 18 were written by the NYT editorial board and reflect the paper’s own opinion. Keep in mind that these commentaries are entirely separate from the NYT’s news reporting, and are meant to reflect the opinions of their writers. The editorial board is clearly critical of government policy, of Modi and of Hindu nationalism, but has also commented on topics such as the national budget, air pollution and Delhi state elections without taking an overt political or ideological position. Note that there is nothing illegitimate in the editorial board taking ideological stands. The op-eds are, however, more diverse. An overwhelming majority relate to topics that either do not call for a political stance, or the writers choose not to adopt one. There is some criticism of Modi and of government policy, but there is also some support for both. Which means that strong Modi critics like writer Sonia Faleiro do not represent the entirety of India content on the NYT op-ed page. The paper does, on the other hand, display a clear ideological stance. This should not surprise anyone who pays attention. In a 25 July 2004 comment, then NYT Public Editor Daniel Okrent answered the question of whether the NYT is a liberal newspaper with a succinct: “Of course it is.” He added that the NYT editorial page is so “thoroughly saturated in liberal theology that when it occasionally strays from that point of view the shocked yelps from the left overwhelm even the ceaseless rumble of disapproval from the right.” Furthermore, he contended that the op-ed editors “do an evenhanded job of representing a range of views in the essays from outsiders they publish”. 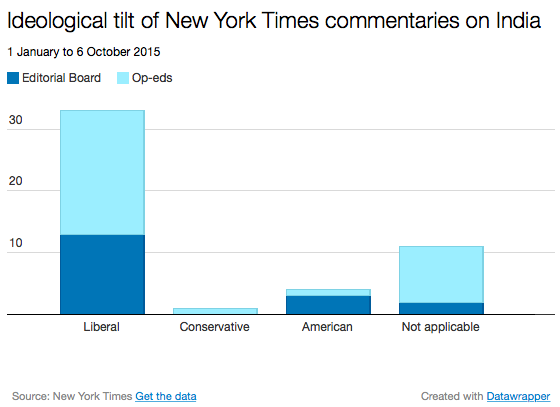 The first chart above does show a greater diversity of views among op-ed contributors than in the editorial board, but even op-ed contributions are overwhelmingly liberal in their orientation (in US terms). This arises, to quote Okrent again, because “the paper’s heart, mind and habits remain embedded” in the culture of New York City, and “because getting outside one’s own value system takes a great deal of self-questioning”. Fans would no doubt consider this a good thing (words like cosmopolitan, progressive and multicultural come to mind), while critics would not (and apply labels such as elite, East Coast establishment, godless). And liberal east coasters are unlikely to be sympathetic to Narendra Modi and Hindu nationalism. Note that the editorial board has zero “good stuff” to discuss, and the op-ed pages carried all 11 pieces in this category. Hate away. the substance of NYT is rabid anti-India/ anti-Hindu/anti-NaMo..
Make someone else fool. NYT is rabid India/Modi hater. Most of the content are biased, fact-less and pure propaganda….. So this crap analysis doesn’t mean anything…..
And a good day to you too, sir. How did you generate those graphs? What classifications methods did you use for categorizing the data as you did (“liberal” vs “conservative”, and “critical of modi” to “mildly critical of Modi”, for e.g.)? Did you use semantic analysis or linguistic experts? I’m guessing you didn’t, which doesn’t necessarily mean that your findings are flawed, but did you validate your classifications? No, just read and coded them myself. Anyone else is free to replicate the analysis. Cool. Might be useful to attach a little footnote with that information for readers. People tend to disagree on what “neutral” is. It does say “And this is what I found:” above the first chart. Not clear enough?